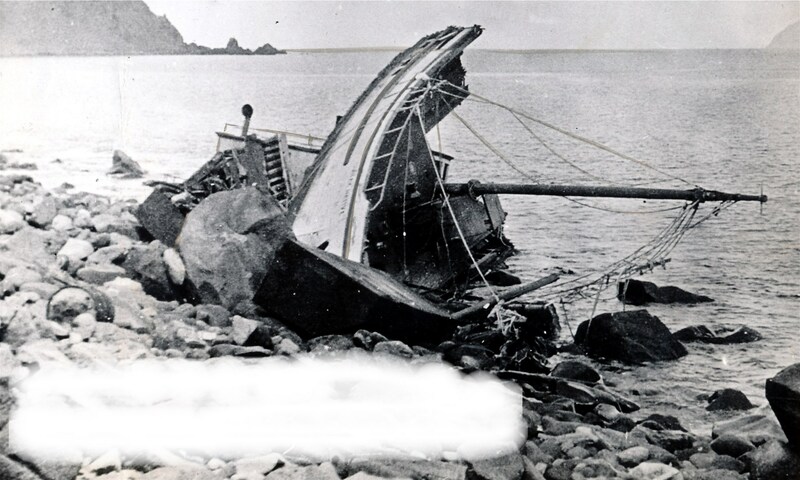 January 22, 2004 Greg Clark from Cape Pole was lost when his 32 foot wooden commercial beach logging vessel Katrina struck a rock and broke up at Cone Cove. Two Labrador retrievers were lost with Clark but one, “Brick”, was found several miles from the accident the following month very thin but alive. February 5, 2004 Daniel Raymond Roehl (20) died in a fire aboard the 44 foot fiberglass cod fishing vessel Little White Dove while docked at Sand Point. February 18, 2004 Sitka resident Ronald Richter (52) was lost and his 26 foot recreational fiberglass boat crashed into the breakwater outside Thompson Harbor at full throttle. It was not know whether Richter was thrown from the boat and drowned when the boat crashed or fell overboard before it crashed. His small terrier was also missing. March 15, 2004 A 52 year old crewman died of an apparent heart attack aboard the 75 foot trawler Blue Fox out of Dutch Harbor. April 12, 2004 Paul Jensen (53) died aboard the Caravelle when a line snapped and hit him in the back near Cape Barnabas on the E side of Kodiak Island. April 13, 2004 One crewman was lost from the fishing vessel Heather Kay after falling from a fish dock access ladder in Homer. June 18, 2004 One person was lost and one rescued from an overturned setnet skiff near the confluence of the Egegik River and the King Salmon River. June 27, 2004 Three crewmembers were injured and one lost from the 69 foot fish tender Steelhead when Freon leaked from a refrigeration system near the bow of the vessel. Branden J.D. Benard (20) from White Rock, British Columbia was lost. The crew was unloading 32,000 pounds of chum and sockeye salmon at the Nautilus Fish Plant in Valdez. August 27, 2004 Robert G. Lane (35) of Anchorage was lost from the 41 foot seiner Hunter between King Cove and Sand Point. September 4, 2004 Two persons were lost and three rescued from an unnamed 22 foot boat near Rugged Island 25 miles south of Seward. The tour boat Coastal Explorer spotted debris in the water, investigated and was able to pick up three survivors. Lost were Jong Sil Lee (48) and Deok Won Cho (53). September 11, 2004 10 year old Dustin Gates died of hypothermia after the 16 foot skiff he and three adults were fishing halibut from sank in Kachemak Bay. September 21, 2004 Joe Spink was drug overboard and lost from the vessel Jeanoah. Spink’s rain gear became entangled in longline gear that was being deployed by the vessel. November 20, 2004 The overturned hull of the 26 foot cabin cruiser Julie K was found capsized near Horse Island with two deceased dogs on board. Also lost were James Mitlika (30) of Eagle River, owner of the vessel and Nick Mayer (30) of Hoonah. The two were best friends since elementary school and had departed Juneau to fish and hunt. November 30, 2004 Molly Ahlgren, long time fisheries professor at Sheldon Jackson College of Sitka was lost from the Amy Nichole when the vessel ran aground on Gavinski Island while responding to a medivac mission. The operator of the Amy Nichole was treated for minor injuries. December 9, 2004 6 of the 26 crewmembers of the 738 foot freighter Selendang Ayu were lost when a U S Coast Guard Jayhawk helicopter crashed attempting a rescue in contrary weather on the north end of Unalaska Island.